So I drug myself out of bed. Came downstairs with Elliott Richard and got him breakfast. Then I just sort of zoned for a while. Rob woke up. And he gave me my morning Heparin injection. (Fun. Fun.) We all hung out for a little while before we got ready to take Elliott to Grandma G’s. She was kind enough to watch him while Rob took me for my second Celestone injection. We dropped Elliott off and hung out for a bit. We left Dr. D’s office. I cried some more. (It hurt!) And Rob surprised me with Taco Bell for lunch because he said I had earned it. Then we hung out at Mom G’s for a little while before packing up Elliott and heading home. Now imagine my surprise and confusion when I return home to find an orange and white box (not this box but similar) on my front porch. Granted, I’m expecting a few packages from things I’ve ordered with an Amazon.com gift certificate I earned in a beta test. But I didn’t order anything that would come in a box like that! 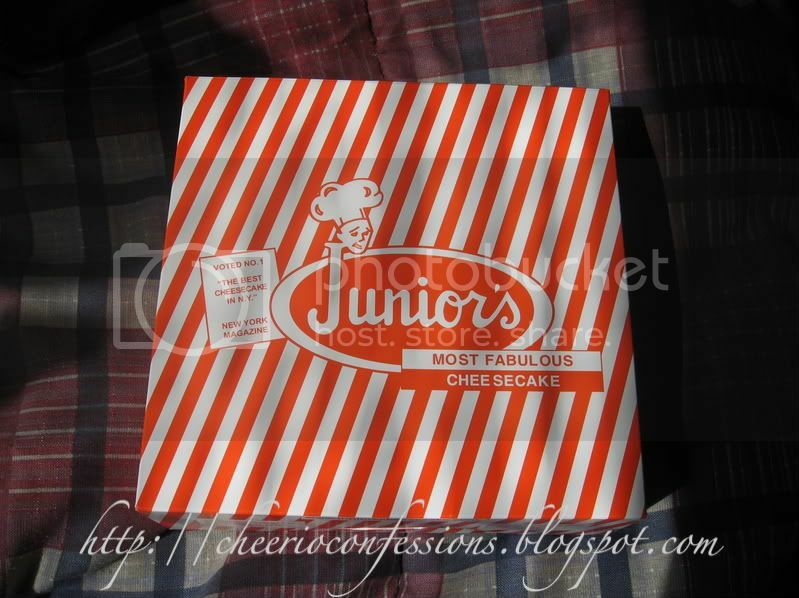 Now imagine my shock and elation when I read the box and saw it was from none other than Junior’s Most Fabulous Cheesecake!!!!! Yeah baby! Now allow me to insert some back story here…I love the Food Network. One of my favorite shows is “Throwdown with Bobby Flay”. (I *heart* Bobby Flay! Even more since I found out he’s married to one of my favorite actresses from Law & Order: SVU!) For those of you who don’t know, Throwdown is where Bobby takes on a “master” in making their signature dish. In this episode, it was Bobby vs. the owner of Junior’s. (Apparently, Junior’s is known for having the best cheesecake in NYC.) So I innocently (I swear, I meant nothing by it!) sent a text message to my best friend, Laura, who happens to work in NYC. (I do this every time there’s a Throwdown with an NYC based food because I want to know if she’s had it and if it’s really *that* good.) She said that it was in fact that good. I told Rob that some day I want to visit NYC to see Laura and try all these foods I see on Food Network. Never in my wildest dreams did I expect this! 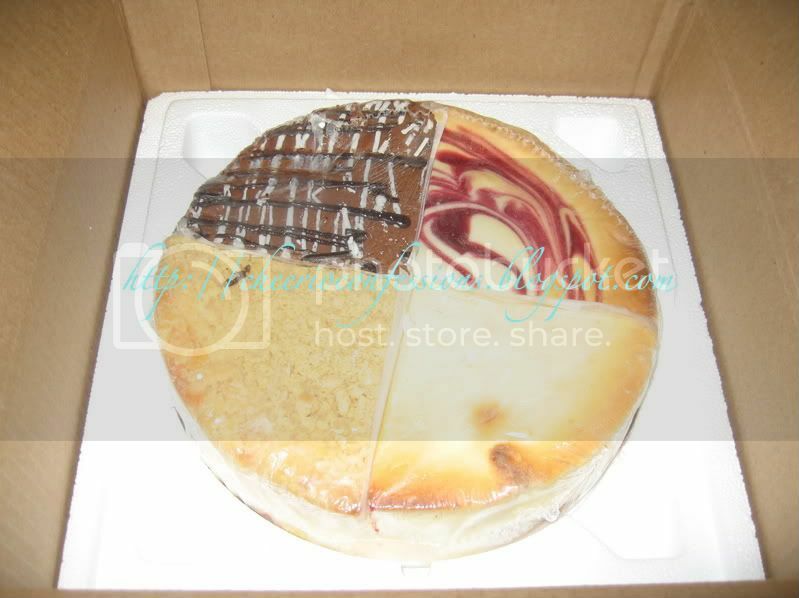 In the box, I found a CHEESECAKE!!! 🙂 It’s a Junior’s cheesecake!!! It has chocolate ganache, original NY cheesecake, raspberry swirl, and cherry crumb. My problem at this point, where do I start? The owner of Junior’s said his favorite of all their flavors (of which they have many) is the original. And I must admit that “plain” cheesecake is usually my favorite as well. However, they are all calling out to me. Kick those prayers into hyper drive!!! !